As the huge Continental jet lumbered and roared its way down the runway and slowly lifted itself into the night sky, I gazed out as New York City gradually crystallised into a million glittering lights below me. I watched rivers of cars floating along ribbons of highway and patches of inky nothingness which marked bodies of water. As the beauty of the scene below melted into my consciousness I thought about the last time I had flown out of New York. I was 18 years old and like today I was returning to a country deep in recession and unsure of where my future lay. Back then in 1981, I had spent a few days in New York visiting the sights which included a trip to the top of the World Trade Centre. I retold my children this experience last week as we stood gazing into the hole that is now known as Ground Zero. My girls are too young to remember that awful day on the 11th of September 2001, but for most of us it is a day burned into our memories forever. The fact that I, like many, watched live as the horror unfolded, connects us strongly to what happened that day. After visiting the site last week, we went on to the WTC Tribute Centre. This is a centre which focuses on the human stories of 9/11. It doesn’t dwell on the horror of the day. I saw no video of the actual moments when the aircrafts hit the centre, no footage of the people who jumped to their death that day, no attempt to explore who committed this awful crime. No, this centre tells us about the community that was WTC – the people who worked there, who ate there, and who shopped there. And by focusing on these stories, this very human face of 9/11, it is incredibly moving. We were all deeply affected by the experience. The last element of the centre offers visitors a chance to record a message or a reaction to what you have seen. I was fascinated that my two girls, unprompted, both sat down quietly and wrote a message on the special message cards. Their words were private and they posted them into the box without showing them to me or Paul. I had been unsure as to whether to include Ground Zero on our holiday itinerary – its horror is still fresh in my mind and I didn’t want them to be scared by it. But the WTC Tribute Centre’s approach and its focus on sharing ‘person to person stories’ meant it was a poignant and emotional experience not only for the children but for Paul and I too. I salute the families of 9/11 who have created a very special and fitting tribute to the 2,752 people who lost their lives in that place that day. We left feeling humbled but also uplifted by the connection with those so deeply affected by the events of September 11th 2001. New York is a wonderful city and a unique one. We often hear of the special energy the city has. Paul, being a photographer, kept commenting on the light in the city. Perhaps it is because the sun’s beams are bounced around the millions of windows contrasting with the deep shadows thrown by the skyscrapers but the light in New York definitely seemed to dance and sparkle all around us. Having spent five days in the energy of this huge, noisy, bustling city I hope that we have returned with just a bit of the special light Paul talked about. Along with the heart to heart connection learned in the WTC Tribute Centre, perhaps we can learn to shine that light forth and shine our way into our futures. This is a weekend of magic. Tomorrow night we should hopefully be treated to a wonderfully enlarged and brightened full moon as we witness what has been called a Supermoon. This phenomonen occurs about every 20 years when the moon comes about 17,000 miles closer to Earth. So, hopefully the weather will co-operate with clear skies so we can admire Grandmother Moon as she hangs in the sky, 14% larger and 30% brighter. 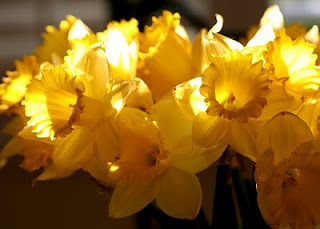 This weekend is also the Spring Equinox (Sunday) when the hours of daylight and darkness are equal. This was a very important festival in pre Christian Ireland and one still marked today by Pagans. The Equinox marks the mid point of the Celtic Spring which began on 1st of February. It is time to get out into the garden. Clear away the debris from winter storms and make ready for the abundance of summer. The Equinox also reminds us to check our own lives for balance. I am always amazed that the animals I live fully recognise the new season. They too feel the pull outdoors. Dylan da Dog drives me mad with is constantly looking to go out, and then coming in only to want out again 30minutes later. But the cats being more independent by having their own cat flap enjoy heading out to a sunny area to sit for a while and contemplate life. BY THE WAY: If you are near a radio or online tomorrow (Saturday) at about 11.40 (GMT) tune into 4FM (94.4 in Dublin or online www.4fm.ie) tune in. I will be on with Gareth O Callaghan, shooting the breeze. Today is International Women’s Day. A video featuring James Bond actor Daniel Craig, dressed as a women and voiced by Dame Judi Dench was released by Equals (a partnership of various charities) to highlight the injustice and inequality that still exists for women around the world. The basic thrust of the film, I have no issue with, although I am not convinced that dressing Mr Craig in drag is of any value other than ensuring coverage in the tabloid press. However there were some statistics that bothered me. According to Judy Dench although we women do two thirds of the work, we only earn ten percent of the wealth. Many of us still are likely to lose our jobs if we become pregnant. We often are barred from work because of the lack of childcare. This makes me want to scream. Not because of the inequality of it, but because these kind of figures, this kind of rhetoric assumes that all women want to be equal to men in a man’s world. A world where one’s worth is measured by how much you earn. A world where your worth is also determined by how high up you are on the corporate ladder. A world where once you give birth you are assumed to want to place your baby in childcare so you can run back into the workforce and continue your climb through the glass ceiling to the boardroom where you hope you will be treated as equal to your male colleagues. I’ve been around the block a few times. I have had a career. I loved it. I used childcare. I sat at the management table and I am pleased to say I never felt unequal. I think I was probably lucky. But I totally bought into the feminist notion that I was achieving. However I wasn’t happy. I was bloody exhausted. Circumstances (and not any sudden blinding flash of insight on my part – but then again I was too busy to think much) conspired to my deciding to leave work, just for one year, in order to be at home with my family. My baby daughter had some health issues and my father was dying at the time. To this day I am so grateful to both of them for forcing me to step back and reassess my life. I have been at home, looking after my family for the last ten years. I write. Sometimes I even get paid for my writing. But coming up to the ripe old age of 50, there is one thing I know for sure - I do not want to be equal in a man’s world. I want the world to allow me be equal for who I am. I dearly wish my feminist sisters would stop trying to compete with men in this very imperfect society we have created. I want women to re-imagine a new way of being equal. It is a man’s world. I want an equal world. On paper I earn very little. But as Dame Judi says I work just as hard as my hardworking husband. He earns the money. I care and nuture and organise the home and our family. So on paper I am adding to these flawed statistics. But I am not unequal to my husband, unless you are judging earning power as a measure of equality. My equality comes from the fact that my husband and I agree that he earns our money, not his money. I want to be equal so that when I do meet my career sisters and brothers I don’t feel inadequate about saying that I am a ...... and there’s another problem right there. I don’t even have a title that adequately even comes close to describing what I do. I want to be equal in a world where women (or men) who stay at home with children are genuinely valued and respected. To me it is no wonder there are so few women who are at the top of industry, in politics, etc The fact that we are not there is not altogether men’s fault. We are not there largely, I believe, because we choose not to be. Because our wiring is different. Our values are different. We are not men. But we are afraid to say it. It is so ‘politically incorrect’ to say that I do not want to put my children into childcare so that I can work long hours and sacrifice my core instincts. I am not saying that all women feel like I do, but I would say that I am not alone. So sisters, fight on if you like. But you are on the road to nowhere because we are not all behind you. Some of us are dreaming a very different dream of equality. But maybe it’s time we took the courage to speak up! WHY NOT HAVE THE KIDS SHOT? It's Happy Faces Day again this Saturday. This is the day when Irish Photographers open their studios and make their talents available in order to raise funds for charity. This years charity is Cystic Fibrosis.... a most worthy cause. As many of you know, my dearly beloved is a photographer and he will be setting up a studio in Cabinteely - in our beautiful new Parish Centre, just behind the church from 10am till 3pm. So why not pop in - no appointment is necessary - and get some professional photos taken and help a great cause. Yesterday, 6th March 2011 was my dear ole Dad's 10th anniversary. It's hard to believe he has been gone that long. But it was fitting that a story of mine in which he features was recently published in The Examiner newspaper. It is not online so I reproduce it below. I hope you enjoy it! Sprawling on the floor, preferably in front of the fire while rummaging through a box of old photos is one of my favourite ways to pass a rainy afternoon. My kids also love seeing old pictures and the stories that go with almost every one of them. We laugh at the hairstyles and the strange fashions of the 70s, as I recount my childhood holidays on farms around Ireland. It’s the hair and make-up that make the 80s photos highly entertaining and confirm my children’s suspicion that I was never cool. And as they laugh, I wonder how different it will be in their future when they look at their childhood photographs with their own children. There won’t be a box that’s for sure. No, it’s more likely that they will be looking at the images on a large TV screen – which in fact will make out-of-date fashions look even more hilarious. When I was growing up my mother kept the good family photos in one of those old fashioned fake leather albums, each picture held in place by black corner sticky hinge things. The photos that were not deemed good enough for the album were placed in an old battered Jacobs Biscuit Tin. In this biscuit tin were the funny photos, the out of focus ones, and ones of my parent’s courtship. As a child, I had my favourites. Finding them in the biscuit tin was like greeting old friends. One of my very favourites was taken while my parents were on honeymoon in Rome, an exotic location in 1960 and only made possible because my father worked in Customs and Excise at Dublin Airport and was gifted the flights as a wedding present. The photo had the pair of them sitting on a bench in Rome Zoo with a young lion cub on their laps. Another of my favourite photos caught my mother in the evening sun, sitting outside our house with one of my brothers, who was about 6 months old, on her lap. They were both dark and tanned and in the gentle light of a summer evening my mother looked incredibly beautiful. But there was one photo in the Jacobs Biscuit Tin which un-nerved me every time I uncovered it. It was a large glossy press type photo of my father, resplendent in his Customs uniform leaning over to give a very glamorous woman a kiss on the cheek. The woman was clearly not my mother. When I asked who she was, my mother replied “oh some actress from America. I think she was called Margaret O Brien. The press photographers were at the airport when she arrived and wanted a photo, so your dad was picked out to do the honours.” My father did look very delighted with himself. He was certainly a handsome man. But that was no excuse and I was not impressed. No, I wasn’t at all happy about this hussy, who dared to kiss my father, resting among our precious family photos in the biscuit tin. A few years ago we were lucky enough to have a holiday in California and naturally visited Hollywood. We did all the touristy things, touring the stars homes in Beverly Hills, Grauman’s Chinese Theatre and the Hollywood walk of fame. But one of the places I really wanted to see was The Kodak Theatre, home of the annual Oscar Ceremony. Although only opened in 2002, the theatre is a beautiful building full of art deco lines and elegant architecture. We were guided around by a wonderful woman called Barbara. We saw a real Oscar. We heard about ‘seat fillers’ – volunteers who must come dressed appropriately and wait outside the theatre until they are whisked in to fill a seat vacated temporarily by a ‘real guest’. We also got to stand on the stage and gaze out over the auditorium while imagining what it might be like to stand there, gushing a speech of thanks on Oscar night. As we left the stage our guide led us down the same corridor the movie stars use as they make their way to do their first post Oscar interviews. This hallway was lined on both sides with beautiful black and white photos of movie stars past and present....Clint Eastwood, Dustin Hoffman, Meryl Streep, Julia Roberts, Tom Cruise and a face that stopped me in my tracks. Yes, there she was, bold as brass, the imposter from our old battered Jacobs biscuit tin, Miss Margaret O Brien. Miss O Brien won an Oscar in 1944 for her part as Tootie in the movie ‘Meet Me In St Louis’ with Judy Garland. “She kissed my father” I announced to my very bemused family who had never rummaged in the old Jacobs biscuit tin and had no idea what I was talking about. So I recounted the story for my clearly dubious audience, assuring them I had the proof at home. As we walked on down the corridor I could feel my late father’s presence and he was grinning from ear to ear. Like my children’s opinion of me, I had never considered my father to be cool. But here in the world famous Kodak Theatre in Hollywood, I changed my mind. 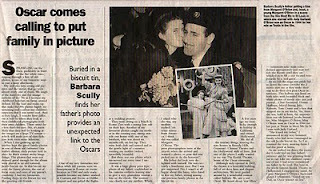 As I gave Margaret O’Brien a backward glance I whispered, ‘Good on you Dad, an Oscar winner no less’.